Take a flight from Indore 06:50 Am. Reach Delhi at 08:25 Am. Take a flight from Delhi at 12:45 Pm. Reach Srinagar airport 02:15 Pm Pickup form airport & Transfer to houseboat. On Arrival Check in at Houseboat. overnight stay in houseboat. After Breakfast leave for Pahalgam by surface. Approx 85 Kms. Will be covered in about 2.5 hrs. En route, visiting saffron fields and Awantipura Ruins (1100 years old temple of lord Vishnu built by king Awantivarman), enjoy the beautiful countryside on the way. Arrive at Pahalgam (the valley of shepherds) and transfer to Hotel. Check in at Hotel and overnight stay in hotel at Pahalgam. After breakfast Local Pahalgam sightseeing in Morning. Free for individual activities, Visit Chandanwari and Aru. Ponies ( self as union in pahalgam dose not permit this travel for non local taxis ). Overnight stay in hotel. After breakfast drive to Gulmarg via Srinagar. The distance of 144 Kms. Will be covered in about 4 hrs. En route, visiting saffron fields and Awantipura Ruins (1100 years old temple of lord Vishnu built by king Awantivarman), enjoy the beautiful countryside on the way. Drive through the pine forest. Reach Gulmarg. On Arrival Check in at hotel. Stay overnight in Gulmarg. 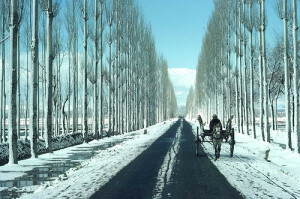 After breakfast Visit Gulmarg Sightseeing Gulmarg has one of best ski slopes in the world, and one of the highest golf courses in the world with 18 holes. View of Nanga Parbat if the weather permits. Fascinating views from Tangmarg to Gulmarg. A short trek up to Khilanmarg, which can be covered in about 3 hrs. is Optional. The Gondola Lift for mountain rides in also available. Back to hotel. Overnight at hotel. After Breakfast Check out from Hotel After Leave for Srinagar by surface approx 56 Kms – 2 Hrs. On arrival transfer to Hotel. Check in at hotel. After Visit sightseeing of the Mughal Gardens visiting Nishat Bagh built by Asaf Khan, the brother-in-law of Jehangir in 1632 A.D., and Shalimar Bagh built by Jehangir for his wife empress Nur Jahan. All the Gardens are situated on the bank of the Dal Lake with the Zabarwan hills in the background. En route the gardens, visit a carpet weaving factory. Lunch at houseboat/hotel. Afternoon Shikara ride on the Dal Lake, visiting floating/ vegetable gardens. Dinner & Overnight at hotel. After Breakfast Full day excursion to Sonmarg by car. The distance of about 83 Kms. Will be Covered in about 3 Hrs. time Sonamarg lies in Sindh Valley strewn with flowers and surrounded by mountains. Sonamarg is also the base for some interesting treks to high altitude Himalayan Lakes. Drive back from Sonamarg and transfer to Hotel and overnight stay. After breakfast Early Morning check out from hotel transfer to Airport. Take a flight from Srinagar at 10:55 Am. Reach Delhi at 12:40 Pm. Take a from Delhi at 05:00 Pm. Reach indore at 06:25 Pm. Any items of personal like tips, laundry, telephone calls etc.